When it is hard for me to pray, I turn to a tiny library of three books that have grown to mean a lot to me. They are one of the resources I point toward first when people ask me how to pray effectively for their children, husband, or friends. 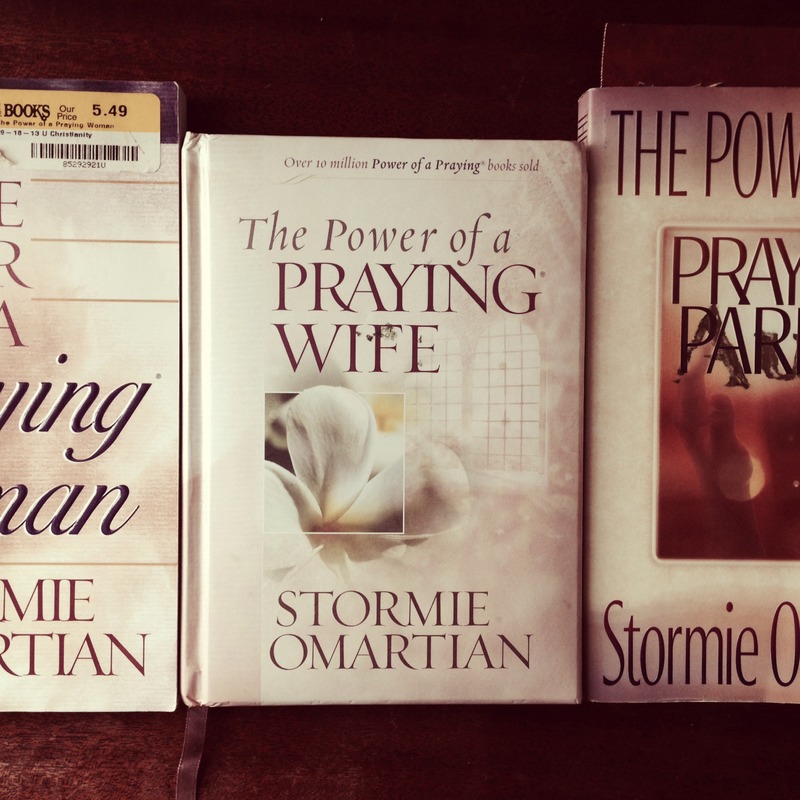 This tiny library is the Power of a Praying … series by Stormie Omartian. She offers 30 days of prayers on certain subjects of great concern to all of us. Bible-verses support every prayer written in the book. I pray through them by the day of the month, meaning, if it is the 14th day of the month, then I will pray prayer #14. I first purchased The Power of a Praying Wife to have a guide in praying for the men in my family. I even wrote over the word “Wife” on the cover, penning “Sister” in gold ink. As I read through The Power of a Praying Sister, I changed all of the pronouns, of course, so that whenever a marriage relationship was specifically referenced, I mentioned a name other than mine. For instance, when I read sentences like, “Let me be continue to be his best friend, I would say instead, “Let his wife continue to be his best friend.” Over time, I witnessed the tremendous impact these Scripture-based prayers were having in the lives of these men, so I made a longer list, about 50 men who are significant to me, and pasted it in the back of the book. About one per week, I say all of the names aloud, then turn to the prayer for the day and read it one time for all of the men at once. I now do the same thing with The Power of a Praying Woman, which has a list in the back of 50 or so women who are special to me. And I do the same with The Power of a Praying Parent, which lists 50 kids I treasure, whether my own nieces and nephew or the children of close friends. At first, I wrote Power of a Praying Aunt in gold, but it has since rubbed off, just like Sister has rubbed off my Praying Wife book. At first, I did not feel that I was praying authentically when I prayed prayers that were written by someone else. But then again, I do not have a problem singing praise songs that someone else has written. If I had to write all of my own praise songs in order to feel like I was authentically worshiping, I would be in trouble. So most of my prayer time is original, but once a week, I add a pre-written prayer for the men, women, and children I love. This helps me get specific on days when praying is easy, but it also helps on days when prayer is hard. If I am particularly distracted, reading through the prayer, keeps me focused. The best reason to stay grounded in The Power of a Praying … books? They keep me from focusing only on my own needs. I cannot recommend this prayer resource enough! If you are interested in deepening your prayer life by focusing on the needs of others more than on your own list of requests for God, I suggest trying on of the Power of a Praying … books. You will be so glad you did.